…because I would have told Ginny Thomas to #SUCKIT. This was the inscription on Anita Hill’s Speaking Truth to Power, given to me by my parents in 1997. I wish more has changed in the many years that have passed. But it seems the privileged continue to feel they are owed. …I would like to remind you that none of you have apologized to my parents. At the time of hearing they were nearly eighty years old. They have worked hard all their lives and attempted to raise their children to fear God, seek the truth, and to respect the authority of the government…Your malicious indictment of me was an indictment of them and all that they have taught me. At a time in their lives when they should be enjoying carefree days of leisure activities, they still fear for my safety and well-being. At the very least they deserve a public apology from each of you. I remember watching every moment of those hearings and how the committee made it seem like Ms. Hill was on trial. It’s a stain on everything that the Court stands for that Thomas was confirmed. I’m still stunned beyond belief that Virginia Thomas made this phone call and am anxiously waiting for the other shoe to drop. You know there’s got to be more to this. Love the last paragraph you cite from Anita Hill’s book. And disgusting that Thomas has never apologized and his stupid wife thinks he–of all people–needs one. .-= Cynematic´s last blog ..Crime-fighting by day- sleeping cozily under the covers by night kidchat =-. I really don’t get this at all. I was only 11 when these confirmation hearings took place but they really stood out in my mind. I can even picture watching them on TV. Why do they think he deserves an apology? Obviously no one cared that much since he was confirmed. And we can all see how great he’s turned out as a justice. How great is his judgment if he married this loony lady? It is one of the most shameful events of our generation. Anita Hill is the definition of grace and class under fire. If no one else will say it, I will — Dear Ms Hill, My deepest apologies to you and your parents. They obviously raised you to be truthful and honorable, so they themselves must be so. I wish I had the “power of voice” to say it louder, but I am happy to say it anywhere and to anyone. God Bless you and your family. 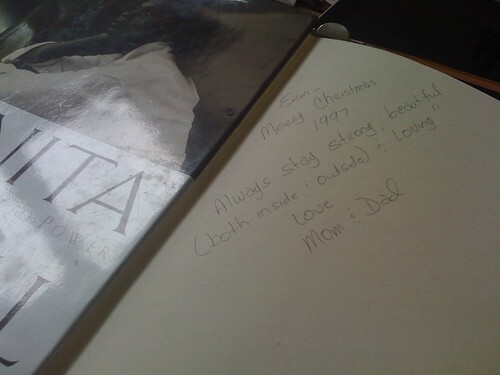 I had tears well in my eyes when I read this post because I’m so amazed at what a wonderful book your parents bought for you and the inscription they wrote in it. Every girl/woman needs someone inspiring her to find her strength. Glad I found your site! Thank you so much for giving everyone an extraordinarily pleasant possiblity to read from this site. It is often very kind and as well , jam-packed with fun for me personally and my office co-workers to visit the blog more than 3 times every week to find out the new items you will have. And definitely, I am also at all times impressed with all the splendid tips you serve. Certain 4 tips in this posting are ultimately the simplest we have all had. The actual combination of and that whitewash allows for a couple of teachable occasions.